In the same way as in the grinding process, machinery manufacturers propose different equipment for mixing and homogenizing with different characteristics and functions. 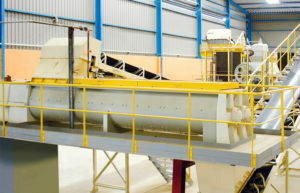 The machines that are used for this process are described below. The Open Mixer is one of the most present machines in the preparation and molding process. It is specifically designed for the homogenization of a mixture of clays and the incorporation of water, or the addition of colorants and additives. Verdés offers a wide range of sizes with its different Mixer models of the 040 series, which can reach capacities of 130 m³/h. The machine consists of a horizontal open trough, crossed by two parallel shafts with integrated steerable knives that rotate in opposite directions and make the mixture advance, while being homogenized by friction. The knives can be oriented in different angles all along the trough, thus optimizing the mixing according to the type of clay. The particularity of Verdés’ design lies in the synchronism of the knives that face each other and generate a “knife-on-knife” effect, thus maximizing friction and intensifying the kneading effect while facilitating the uniform distribution of water or other additives. In the case of the Extruder-Mixer and Filter-Mixer, the efficiency of the mixing, which is reinforced with a group of compression augers, ensures the best homogenization of the material and a better quality in the clay. The Filter-Mixer also incorporates an outlet grid that retains impurities present in the material, whether roots, plastics or other foreign material. 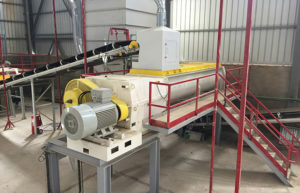 Verdés counts with the models 450/550/650/700/750, both in the Extruder and in the Filter version, which reach a maximum capacity of 65 m³ / h.
The Circular Screen Feeder, or Vertical Shredder is a machine specially suitable for the compaction and final mixing of wet clays. Thanks to its large volume tank, it can also act as a buffer, allowing the absorption of large variations in the amount of input material due to the recirculation of extruded or pressed rejections, and always providing a constant flow of material to the extruder. Verdés offers in its range of Circular Screen Feeders the models 204 and 205 with tank diameters of 1400 mm and 1900 mm respectively for productions from 10 to 65 m³/h. The machine is composed of a vertical cylindrical tank which circumference perforated screens, a vertical rotating shaft and a collecting pan in the exterior that drives the material back to the line. 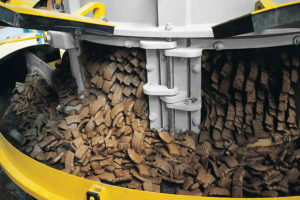 The machine incorporates a circuit for the addition of water and the possibility of including screen covers to avoid the formation of dryout material. – Grinding process: At this stage it is not possible to make a comparison. 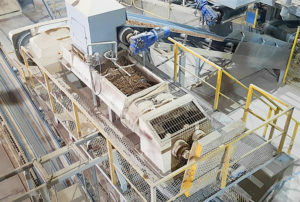 Throughout this process, the clay progresses through each different grinding phase (Primary Crusher, Disintegrator / Wet Pan Mill, Roller Mills, etc.). It is mainly Open Mixers that perform the task of homogenizing the clay in different points, allowing the mixing of several different clays or the addition of other compounds such as coal, cellulose, sands or other additives that each confers different properties to the mixture. 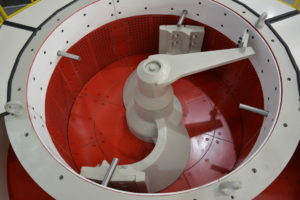 In addition to this function, the Mixers allow the advance of thicker and drier clay within the trough, performing a mixing process by friction carried out by the knives. This homogenization is more efficient the greater the length of the trough and also the lower the degree of inclination of the knives and the rotation speed, since the advance speed of the flow is reduced, increasing thus the time of residence of the mixture in the trough but also affecting the capacity of the machine (there will be a compromise in the Mixer between the desired productivity and the mixing quality). – Immediately before the extrusion: At this stage we can compare the performance of both machines. Here, the clay arrives from the last milling process (Roller Mill, Hammer Mill, Pendular Mill) with the minimum particle size. After being the particles broken in the milling process, new and finer particles are present but again with a heterogeneous moisture and distribution. These particles are conducted to a final stage of homogenization, wetting and mixture with additives if needed in order to make that the mud that reaches the Extruder keeps its properties as constant as possible in particle distribution, moisture and compaction. This way the final product will present the best mechanical and aesthetical properties. 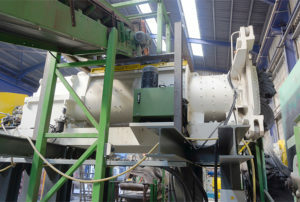 Open Mixer: It performs a simple but highly performant work. It fulfills the function of mixing and adding water without compacting the mixture. 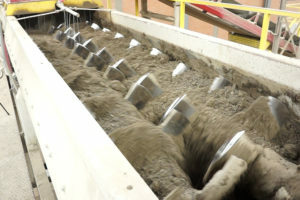 When advancing horizontally, the mixer works better at full load since the clay has more contact surface with the knives. Therefore in order to obtain the maximum efficiency of mixing, the feeding rate of the machine must be regular. This is achieved if the installation has a constant input of clay (without recirculation of rejects from the extrusion o press). In case of the existence of a recirculation of rejects that may arrive at an irregular rate, the line must count additionally with a Box Feeder able to regulate the possible peaks of infeed material. This solution will optimize the operating cost, since it is the one that requires less investment and less energy expenditure. In addition, it allows simpler maintenance tasks. It is the most recommended for hollow bricks or block factories, in which it is desired to minimize manufacturing costs. Extruder-Mixer, Filter-Mixer: To obtain a higher degree of homogeneity and provide greater quality to the final product, these variants of the mixer can be taken into account. To the mentioned qualities of the simple Open Mixer, these ones provide a final stage of compaction, either by extrusion or against the grid. By providing greater compaction to the extrusion stage, excessive energy expenditure in the further compression work is avoided at this point, and wear of the Extruder elements is reduced. 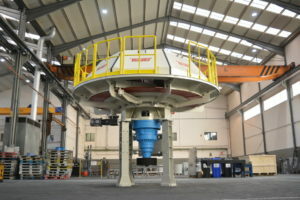 These machines have a higher power, comparable to that of the Circular Screen Feeder, and therefore the energy consumption will be greater than the previous option. 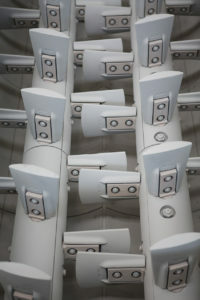 Its use will be appropriate for productions of high added value, such as facing brick or roof tile. 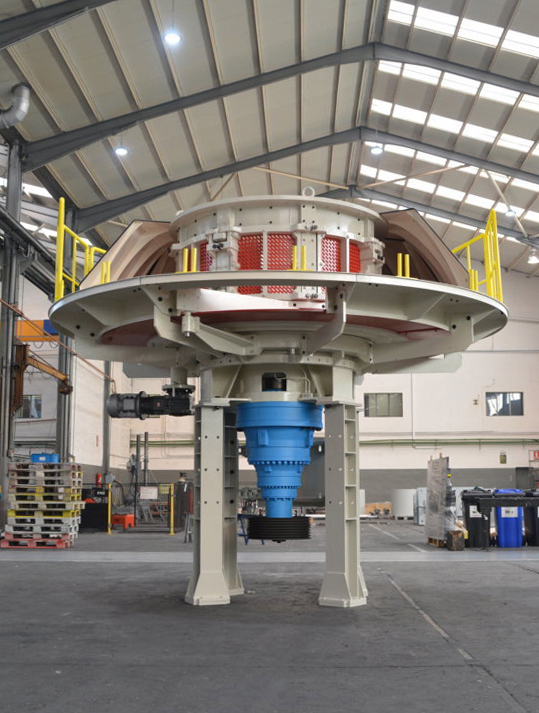 Circular Screen Feeder: It corresponds to the larger machine and therefore the one with greater investment and energetic and operational costs. By counting with a large tank and a vertical rotor, this machine is capable of working both at full load and with a semi-full load. Unlike the Open Mixers, this machine can absorb the infeed variations by itself. 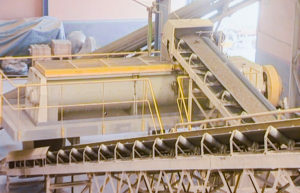 The machine allows the addition of water or steam but not the mixture with additives, and compacts efficiently the clay against the screens, although the mixture by friction is less extensive than in an Open Mixer. 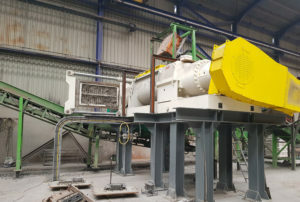 This machine will be the most suitable for processes that have a high variability in the rate of input material, such as those receiving rejects from pressed roof tiles.